Haas are the first team to reveal images of a 2019 Formula 1 car. The American outfit released images of their new VF-19, which will make its public debut in pre-season testing starting on 18 February. Haas have set a target of improving on last season’s career-best finish of fifth in the world championship. The new Haas gives a first glimpse of the new wider front wings mandated this year by F1 bosses in an attempt to improve the racing. This change, allied to a wider rear wing, was introduced with the aim of making the racing closer by making it easier for cars to follow each other. 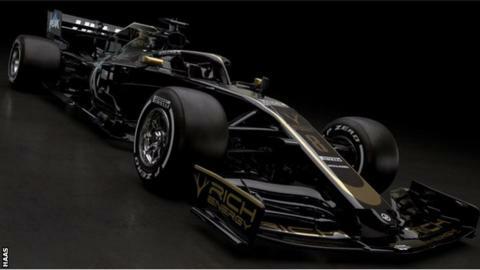 The Haas appears in a new black-and-gold colour-scheme after the signing of a new title sponsor, the start-up energy drink brand Rich Energy, of whom West Ham chairman David Gold is among the shareholders.